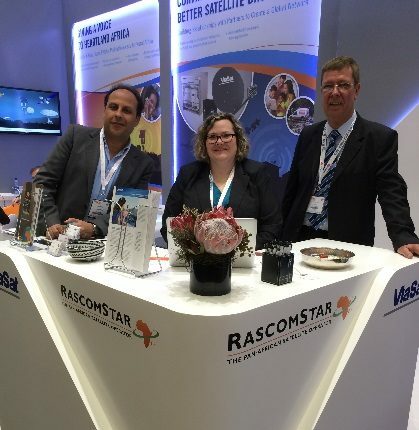 Rascomstar was present with its key partner, Viasat, at AfricaCom – the biggest and best tech event in Africa that brings together all the senior decision-makers from the entire digital ecosystem. Africa Com was a 3 day event which was held from 17th November to the 19th November 2015 in beautiful Cape Town, South Africa. The Rascomstar / Viasat booth at the event was located at F10. The Rascomstar team attending the event along with our partner Viasat team Amy Back and André du Toit.(Photo). The exhibition, which attracts over 10 000 attendees, allows visitors access to more than 25 hours of networking with industry leaders and decision makers from over 140 countries. A great event for visitors to source the latest technologies from the leading international telecoms, media & ICT service and solution providers and tap into three days of content at the AfricaCom Masterclass. This includes Tech, Databiz and Digital TV Transition Masterclasses, with insights from companies such as irtel Africa, SES, Gadget, VMX, Vodacom, IPTV Solutions and Sports News Africa. Rascomstar attracted very many visitors from well-known telecom industry players such as Etisalat [UAE], Hughes Broadband Satellite Services and Managed Networks [USA], the IFC corporation from the World Bank Group, Facebook , WINEGARD [USA], Wireless Communication [South Africa], WestTec, Orange [global mobile operator], New African press, Developing Telecom magazine and many more. Many visitors from the telecom industry stopped by at our booth for a chat and were very happy to see that RascomStar is still very much alive and well and keeping its footprint in the market.